Moreno received a degree in Business Administration and Economics from Florida Atlantic University in 1975, and an MBA in 1977 from Thunderbird University. He was a Neiman Fellowship recipient at Harvard University, journalist, and Ambassador of Colombia to the US for seven years. 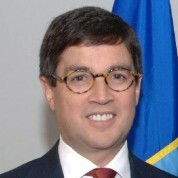 In October 2005, Moreno assumed the presidency of the Inter-American Development Bank. He was re-elected in July 2010 to a five-year term. In addition, he is a Foundation Board Member at the World Economic Forum. He is the recipient of decorations and distinctions awarded by the Colombian state and the country’s private sector, including Orden de Boyacá en el Grado de Gran Cruz, the highest distinction given by the Colombian state.